Usually when we hear of coin hoards being dug up in England, they’re Roman or Saxon or medieval. It seems like people in the UK stumble on ancient buried treasure every other day. 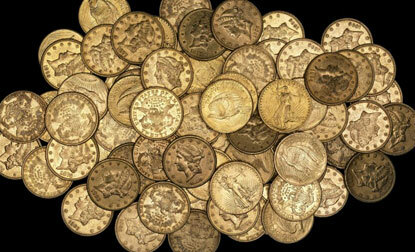 Dozens of gold coins minted in the US in the late 19th-early 20th centuries, however, are not so regularly found. In fact, until a couple of fellas decided to do some gardening in their east London back yard, such a find was unprecendented. The details of the discovery are being kept quiet for now, both to prevent lookie loos and to ensure there are no false ownership claims. What we do know is that two people found a hoard of 80 gold Double Eagle $20 pieces, dating from between 1854 and 1913, in a Hackney garden. Double Eagles are made from 90% gold — 0.9675 troy ounces if it — and 10% copper alloy. The coins come from all over the country, minted in San Francisco, Philadelphia, Denver and Carson City, among other cities. They were worth $20 because that was the fixed value of an ounce of gold in 1849 (yes, the year of the California Gold Rush) when they were first minted. That would be a value of $521.28 in modern buying power, all in one heavy gold coin, and that’s not counting the fluctuating value of the gold itself. Some designs, years and mints are more valuable than others, but there’s little doubt the value of the entire collection will probably reach the six figures. “The catalogue shows that the coins gradually increase in number across the decades from 1870 to 1909 (13 coins from 1870-9; 14 from 1880-89; 18 from 1890-99; and 25 from 1900-9). “Over a quarter of the total were issued in the last 6 six years represented. Together these factors suggest that the material began to be put aside during this later period, rather than being built up systematically across a range of time represented. That means the burier might actually be alive. It’s unlikely, but certainly possible, and his heirs could very well be around to file an ownership claim. The details of the location which have not been released will be used to screen out potential Double Eagle Anastasias. The finders have reported the coin hoard to the Portable Antiquities Scheme, and an inquest has been opened. Any claimants have until February 8 to come forward. If nobody does claim ownership and the coroner determines that it’s officially treasure (which he will because buried gold is pretty much the Platonic form of official treasure), then the Crown becomes the official owner, fair market value will be assessed, and the finders paid in that amount by whichever institution wants the hoard. Hackney Museum has already raised its hand. Meanwhile, the coins will go on display at the British Museum starting tomorrow.